WiFi, or wireless internet, is technology that has taken over our society. The ability to connect a computer or device to the internet without wires has opened up a whole new world of possibilities. From cell phones to home video cameras, digital pressure cookers to door locks – almost anything you can imagine is being manufactured with WiFi capability. WiFi is a convenience, but it can also come with risks. Without proper protection, outsiders can gain access to your network and possibly your personal information. Below you will find tips on how to secure your home WiFi to ensure that your network and information is protected. You want to place your router in a location to where the signal only reaches within your home (or as close as possible). Generally, the center of your house is the best option. WiFi signal typically reaches up to 300 feet outdoors and 150 feet indoors. Your situation may vary, so move the router accordingly. Having the signal only reach as far as the walls of your house will keep your network from being visible from the street or a neighbor’s house. When you set up your wireless router (the device that sends WiFi signal throughout your house), it will come with a default name. This name can be a strange combination of letters and numbers or can have a reference to your ISP (Internet Service Provider). It is important to change the generic name to something different (we like funny names; “Pretty Fly for a WiFi” is a good one). Do not use any personal information in the name, such as “Charlie’s WiFi Network” or “Johnson Family WiFi”. 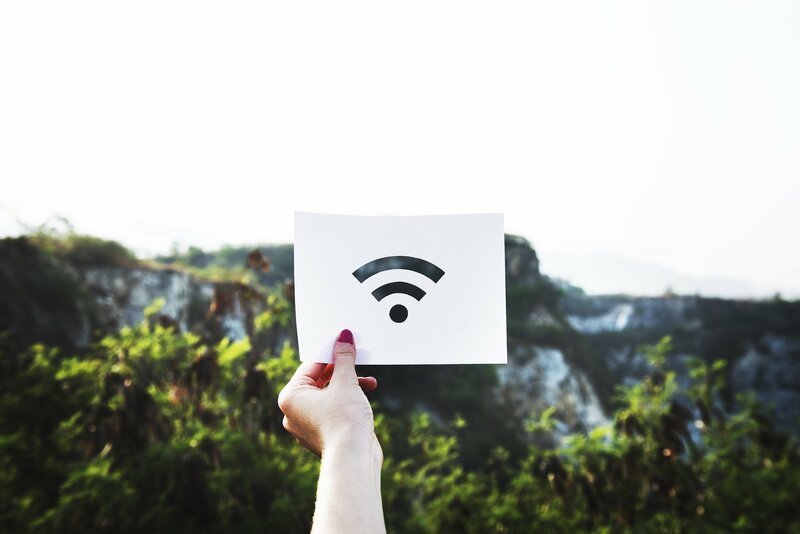 If you’ve ever been to a place with free WiFi, such as a coffee shop, you will notice that you will see their network in your list of available WiFi networks. This is because the business would like to offer you access to their network. At your house, you only want to provide access to your family and any guests you’d like to allow to join. Your wireless router will broadcast your SSID (Service Set Identifier) by default. You can change these settings so that your router does not broadcast your SSID. All you and your family will need to access your network is the network name and password. Outsiders won’t see your network in their available networks which will help keep you protected. In order to protect your information, it is important to enable encryption on your WiFi network. Miriam-Webster defines encryption as, “to change (information) from one form to another especially to hide its meaning”. In terms of WiFi encryption, your data is sent over your network in a format that only authorized users can view it. Those without access will just see a mess of code which will be unintelligible. Encryption will go a long way in safeguarding your personal information. Be sure and secure your home WiFi. It’s quick and easy to do and can help protect you and your family from possible identity theft.